Karl Subban remembers the days when he would take his young son, Pernell Karl, ice skating and look around the rink to see if there was anybody else there that looked like them. P.K. Subban, from skating at age two to millions of dollars as restricted free agent. change. Young Pernell Karl simply goes by P.K. now and he’s grown into a Norris Trophy-winning, slick-skating superstar defenseman for the Montreal Canadiens. Brother Malcolm is in the middle, a 2012 Boston Bruins first round draft pick who played his first year of pro hockey last season for the Providence Bruins, Boston’s American Hockey League farm team. Youngest brother Jordan is a defenseman and 2013 Vancouver Canucks fourth-round draft pick, who skated last season for the Ontario Hockey League’s Bellville Bulls – the major junior team that his older brothers played for. Karl Subban can’t hide a patriarch’s pride that his sons are reaching hockey’s upper echelon. But then, that’s always been the plan. Karl says he reminds P.K, and his brothers that they are “pioneers” who stand on the shoulders of players of color who went before them. Getting three boys to the pro hockey level isn’t an easy task for any family. For Karl, whose family moved to Canada from Jamaica when he was 11, and wife Maria, whose family arrived in the Great White North from the tiny Caribbean island of Montserrat, negotiating the sport initially had its challenges. Karl was bitten by the hockey bug as a kid. He learned to skate while growing up in Sudbury, Ontario, and enjoyed watching the Sudbury Wolves play. The team had a talented forward on its roster, Marson, who later became the NHL’s second black player when he was drafted by the Washington Capitals in the team’s inaugural 1974-75 season. Karl went on to play basketball at Lakehead University in Thunder Bay, Ont., and went into teaching upon graduation. But he still had hockey on his mind. He bought P.K. his first pair of skates when he was 2 1/2. By four, the tyke was playing in a house league. About that time, “Maria and I decided he’s going to skate every day,” Karl told me. 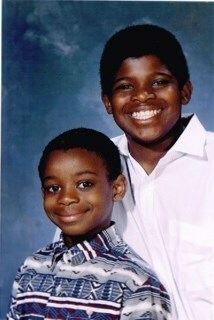 Before they were stars, P.K., right, and Malcolm Subban often skated with dad. That often called for Karl to take P.K. to the rink late at night after he got home from work from two vice principal jobs in Toronto. It also meant that sometimes Maria would put an exhausted P.K. to bed after midnight still dressed in his snowsuit. It’s a recipe that Karl followed with Malcolm and Jordan and with daughters, Natassia and Natasha, in their athletic endeavors. You see, Karl Subban is a firm believer in practice. He was “Outliers” author Malcolm Gladwell long before Gladwell wrote that it takes 10,000 hours of practice to master a task. With that philosophy, Karl Subban isn’t a fan of Allen Iverson. You could almost feel him shaking his head in disbelief over the phone as he recalled the Philadelphia 76ers star point guard’s infamous 2002 rant after being questioned about his practice habits. Fingernails on a blackboard for Karl, a retired public school principal. Masked man Malcolm Subban in action with Providence Bruins. Practice and hard work have paid off for Karl’s boys – and will pay off handsomely for P.K. He scored 10 goals and 43 assists in 82 games for the Canadiens last season, ranking fifth among NHL defensemen. During the Stanley Cup Playoffs, he tallied 5 goals and 9 assists in 17 games, finishing fourth among defensemen in scoring. As a restricted free agent, P.K.’s 2013-14 exploits – including logging a whopping 33 minutes of ice time in a Game 4 loss to the New York Rangers in the Eastern Conference Final – will likely translate into a long-term deal that exceeds $7 million per-season from Montreal or another team that bids for his services. While P.K. waits for an adjustment of digits in his paycheck, Malcolm is adjusting to life as a professional hockey player. In shifting from the OHL to the AHL, Malcolm went from being the main Bull to a back-up Bruin in net. He appeared in 33 games for Providence, won 15 lost 10 and sported a 2.31 goals-against average and a .920 save percentage. He played in six Calder Cup Playoffs games for Providence and came away with a 2-2 record and 2.96 goals-against average. trust. He played 66 games for Bellvelle last season, scoring 12 goals and 30 assists. With his three sons busy pursuing their hockey careers, Karl Subban is still busy building the family’s hockey legacy. He takes his 3-year-old grandson – Legacy Bobb , son of Natassia Subban-Bobb – ice skating often. Legacy’s baby twin brothers, Epic and Honor, will get the same quality time with granddad after Santa delivers them ice skates this Christmas. UP NEXT: Meet the Vilgrains. With the 2013-14 season set to begin Oct. 1, National Hockey League teams are busy whittling down their training camp rosters, assigning not-quite-ready for prime-time players to the minor leagues or back to their junior teams. Many of the young players of color taken in the 2013 NHL Draft managed to get a brief taste of NHL life before returning to their junior squads to get more playing time and buy time to grow both physically and mentally. Jordan Subban enjoyed his training camp time wearing the Vancouver Canucks blue, white and green. But first-year Head Coach John Tortorella felt the 5-foot-9, 177-pound defenseman, the 115th player picked in the draft, could use more seasoning with the Ontario Hockey League’s Bellville Bulls. The Washington Capitals have high hopes for Madison Bowey – but not for the 2013-14 season. The 6-foot-1, 195-pound defenseman, the 53rd overall pick in the draft, was sent back to the Western Hockey Leagues Kelowna Rockets. Defenseman Madison Bowey is back in Kelowna. “Want to thank the @washcaps organization for giving me the opportunity to have an amazing experience at the main camp,” Bowey tweeted on Sept. 15. The next day he pronounced himself ready to go for a new season with the Rockets. “Great to be back @Kelowna Rockets boys! Misses the fellas,” he tweeted. When the Buffalo Sabres drafted Justin Bailey, he felt right at home. After all, the right wing from the OHL Kitchener Rangers grew up Williamsville, N.Y. – just a stone’s throw from Buffalo. After a stint in the Sabres camp, Bailey is a Ranger again. Rght wing Nicholas Baptiste, chosen by the Sabres with the 69th overall pick in the third round of the draft, impressed the Buffalo brain trust at the NHL Prospects Tournament in Traverse City, Mich., earlier this month, registering points in three consecutive games. Still, he’s back with his junior team, the OHL Sudbury Wolves. Anthony Duclair not Broadway-bound yet. (Photo: Quebec Hebdo). Duclair, taken with the 80th overall pick in the draft’s third round, is a few seasons away from his Broadway debut. The Rangers sent him back to the Quebec Major Junior Hockey League’s Quebec Remparts where he scored two goals in the first game of the season. Jonathan-Ismael Diaby may someday join Seth Jones on Nashville’s blue line. But not now. The Nashville Predators someday may boast a twin-towers defense pairing of 6-foot-4, 206-pound Seth Jones and 6-foot-5, 223-pound Jonathan-Ismael Diaby. Jones, drafted fourth overall, is likely to make the Predators and is a longshot to make the U.S. Olympic hockey team that will compete at the Winter Games in Sochi, Russia in February. The Predators returned Diaby, the 64th pick in the draft’s third round, to the Victoriaville Tigres for another season in the QMJHL. Meanwhile, defenseman Darnell Nurse is turning heads at the Edmonton Oilers’ training camp. The 18-year-old from the Sault Ste. Marie Greyhounds had an impressive pre-season outing against the Vancouver Canucks recently, playing 23 minutes in a 4-1 Oilers victory. He blocked shots and broke up two-on-one rushes. Defenseman Darnell Nurse – giving Edmonton something to consider. (James Egan Photography). Still, Nurse, picked 7th in the draft, seems destined to return to the Soo, though Oilers players and coaches can’t stop raving about the good in his game. “He’s raw and he’s got some steps to take to get to the NHL level, but I have to tell you we’re really happy with what we’ve seen of him so far,” Oilers Assistant Coach Steve Smith told TSN.